Come summer days and like always one notices that the urban sprawl has extended far beyond the existing territorial jurisdiction of the city administration and is continuing to spill over into the fringe areas. Although, numbers of measures are being adopted by the city authorities to keep it smooth, yet chaotic traffic scenario remains a major issue of concern. Due to limited road width and scope to widen, together with increase in number of private vehicles, traffic congestion, delays have become further grave. Besides fuel getting wasted, air is also being polluted due to congestion. Growth and development of commercial activities along both sides of the road and on-street parking of private vehicles by resident users, is unaverted. Parking demands are increasing in areas such as High Court, SDA complex, Metro Pole, IGMC, Lift, Longwood, Housing Board Colony, Chakkar area, Sanjauli, BCS, Near Khalini bypass, Shoghi Market, Near RTO office, Kaithu, Navbahar, and more (can be identified if surveyed again). Estimated in 2012 the demand for on-street parking in Shimla was about 18000 Equivalent parking spaces (EPS). Whereas the total on-street parking till date available is around 7000 EPS. Clear-cut demand and supply gap of around 11000 EPS from a previous data. Now average data of 2018 Shimla Urban (total number of vehicles in 18 wards averaged per ward) indicates that there could be estimated around 3000 registered vehicles per ward whereas average parking available per ward is barely above 300 eps. Strategies advised in the comprehensive mobility plan of Shimla could have been perhaps the only practical solutions to the alarming traffic woes of the city. On 3rd of April 2012, the final draft for the city mobility plan was approved by the authorities. Yet after 7 years gone behind the plan has barely found daylight. A study conducted seven years back, if could have been put on track as per time schedule then it would have borne results on ground by now. Yet it seems since 2012 the plan is plagued by time delays. In 2012 there was left headed MC and the state was being ruled by a new Congress government. 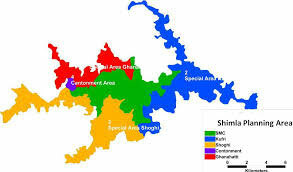 In a conflict situation between idelologies (MC Vs state government) instead of finding self funding means to start the plan phase wise all ( MC & State government) decided to make it part a central financed projects like AMRUT/ Smart city. But not to forget that there was a Congress party UPA in power those days and the plan looked feasible. But perhaps preparations of feasibility studies/ DPRs/etc must have taken some time while the Centre government changed to NDA. But of course another factor which delayed the process could be nonstop opposition between leftist MC of Shimla and State government those days. By the time that everyone realized the urgency of the city mobility plan, challenges were posed due to change of political regime from UPA to NDA. Now the state government versus Central government wars took pace till 2017. But 2017 to 2019 situation was different. The MC, Shimla, State government and Centre were in sync. Yet even after almost two years gone till April, no urgency is been displayed by the stakeholders for putting the comprehensive mobility plan in place. Rather all are hell bound to get the illegal structures legalized, to make the situation even graver. Except for slight improvements (That too more from tourism point of view) the city mobility plan has not caught any traction on ground yet. Ultimately victim would be common public who would lose both ways. As it is the commoner who gets hasled due to such woes (VIPs are never affected). Secondly not to forget it is the tax payers’ money which funds these projects and time loss in delay means additional cost due to escalation.